European missile firm MBDA has pitched the Missile Moyenne Portée (Medium Range Missile) fifth generation anti-tank missile system for co-development and co-production in India. The company has opened preliminary discussions with the Indian Army and DRDO to pursue the pitch. The MMP is described by MBDA as a lightweight weapon system, easily man-portable high level of day and night, all-weather reconnaissance and identification capability, with a confined space firing capability, rapid reaction operation, firing sequence reversibility, lethality against a wide target set: hot and cold targets, including the latest MBTs, with collateral damage risk minimization qualities. The Indian Army recently selected the Israeli Spike ATGM to meet its immediate requirement. 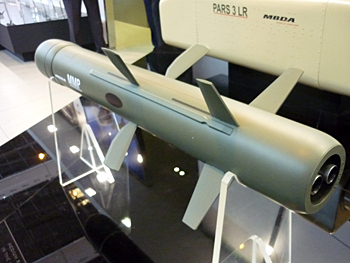 The PARS 3 air-launched anti-armour missile for the ALH Rudra armed helicopter is currently under progress, with no decision made yet. The MMP, MBDA believes, will allow India to be involved in the crucial testing and advanced development phase of the weapon system to meet future needs just of the Indian armed forces but foreign armies as well. In December 2011, the French defence procurement agency DGA had awarded MBDA a risk reduction contract for the MMP programme that will now replace the MILAN weapon system which has been in service with the French armed forces since 1974, and with the Indian Army as well.